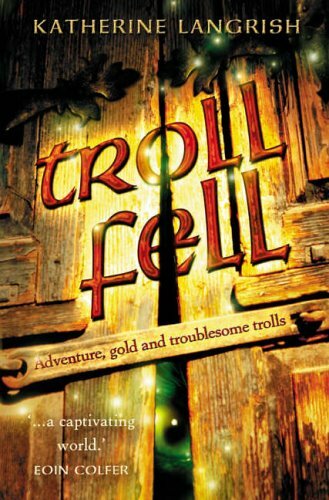 Troll Fell is the first ‘Troll’book by Katherine Langrish. It is about “Adventure, gold and troublesome trolls”! A boy called Peer from Viking times has to go and live with his mean uncles, Baldur and Grimsson. Peer is treated badly and forced to do all the work in the mill at the top of Troll Fell. His first friend Loki the dog comes too. At the mill he sleeps in the barn where he meets a new friend, the Nis. Peer meets another friend called Hilde. She comes round to the mill, whilst going down to the town. They talk about whats been happening. A very long time later the Nis brings news about the Trolls. The Gaffer, King of the Trolls, is having a double wedding with the King of Dovre Fell; another land full of trolls. Baldur and Grim know about Hilde’s father’s troll-gold; a special golden cup that he stole, and they wanted some troll gold for themselves. They asked the Gaffer and he told them “Bring me a boy and a girl of the same age, to be servants.” Sadly for Peer, Baldur and Grim knew about Hilde and he knew they were going to capture her from her farm at Christmas and take them both under Troll Fell to work for the Trolls as servants. This book is about Peer and Hilde’s adventures. It was a great read, I really enjoyed it and couldn’t wait to start book two, “Troll Mill”, which I have almost finished already!!! We are off to the library now, to see if we can find book three, “Troll Blood”. If you like to read the book, you might like to play the game! This entry was posted in Book Review and tagged book, Book Review Troll Fell, Katherine Langrish, Katherine Langrish Troll Fell, King of Dovre Fell, troll, Troll Fell, vikings. Bookmark the permalink. What a great review! Hope you manage to get your hands on Book 3. I have now got book three! Can’t wait to start it! How fabulous that you are a keen reader !! I loved Troll Fell (and the other two books in the series) too! Hope you are now enjoying Troll Blood too, Roo!